The W LOVE Hangover Ball was one of the most extraordinary fashion events that I've had the privilege of attending so far. It took place at the iconic W Hotel Union Square in support of the Foundation of AIDS Research (amfAR). Celebrity Fashion Icon Kelly Osbourne hosted the event and judges included some of fashion’s elite like Fergie, Simon Doonan, Mickey Boardman and many more! I received the invitation about 2 days before the event so preparing the perfect outfit for the “Ball” was a little bit of a challenge. What’s a girl to wear to such a fancy occasion?! Luckily, Eliza J one of my favorite dress companies let me stop by their showroom to pick out the perfect dress. I must say it was quite a Cinderella moment to be dressed by them right before the Ball! When I arrived at their gorgeous NYC showroom there was a selection of beautiful dresses already waiting for me. It was a hard decision but the perfect dress for the Ball was the Eliza J One Shoulder Beaded Patch Metallic Sheath Dress. I loved everything about this dress from the shiny metallic material to the decadent beaded patch that adorned the side of the dress. I knew it was the “one” because it fit like a glove and made me look like a million bucks. The night of the Ball was such a magical experience. It was everything I dreamed it would be and more. I felt so glamorous wearing my Eliza J dress which I paired with my favorite metallic shoes by Jeffrey Campbell. Old Hollywood was my theme for the night so I put on a bright red YSL lipstick for the final touch. When I arrived at the W Hotel there was already quite a long line outside. My equally dapper friend and I went to stand at the end. My name was on the VIP list so we didn't have to wait long before we went in. The inside of the W Hotel was so immaculately decorated that it almost felt as though you were walking into a palace. I couldn't resist taking a photo by one of their sculptures which complemented the golden hues of my outfit. Next, we went upstairs to a room filled with fashion guests and paparazzi who were waiting for the celebrities to arrive. Guests sipped on a selection of cocktails and sampled hors d'oeuvres that were being passed around. A sea of flashbulbs started going off when Fergie arrived to pose for pictures. In person she looked ten times more beautiful and glamorous. Finally, the vogueing competition was about to start so we were all ushered into a big ballroom. Kelly Osbourne came out on stage to give an introduction of the evening and welcome the fashion judges on stage. Gracing the front row were famous faces like Karlie Kloss, Stefano Tonchi, Lily Donaldson, Derek Blasberg, Bryanboy, Richard Chai, Zac Posen, Isaac Mizrahi, Jason Wu Wendy Williams and many more. Ladyfag emceed the competition and was truly phenomenal to watch. She had so much stage presence and humor that you literally couldn't take your eyes off her. 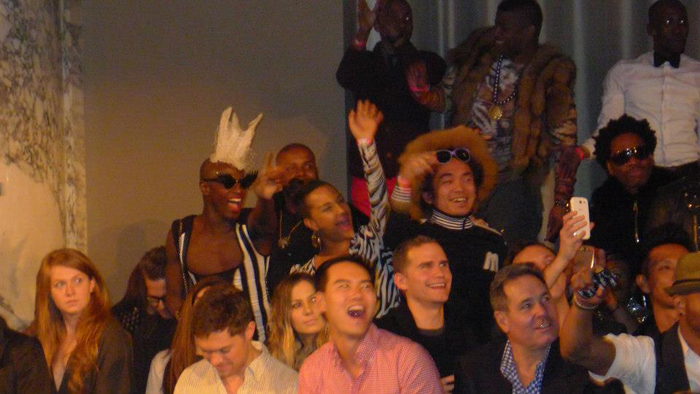 I was in complete awe when the vogueing competition started as I've never seen anything like it in my life. There are no words I can say that will properly describe how amazing each performance was. I found this great video that Derek Blasberg took which will give you an idea of what took place that night. Check it out!